Tender pieces of lamb chops marinated in ginger and mustard, charcoal roasted for an exotic flavour. A subtle blend of vegetables, herbs and spices, deep fried. Shredded chicken blended in selected spices and herbs, deep fried. A blend of herbs, spices and vegetables, enclosed in a savoury pastry shell, deep fried. Sliced onion, blended with flour, herbs and selected spices then deep fried. Selected prawns, cooked in a blend of special spices and served with special bread. Baked fish, minced with onions, green chillies, mushrooms and fresh coriander leaves, tempered with mustard seeds. Diced boneless cubes of chicken, lamb and sheekh kebab, roasted in a tandoor oven. Cubes of chicken, marinated with spices and herbs, roasted and served with a special sauce. A selected king prawn coated with spices, herbs, deep fried and served with salad and sauce. Chicken in rich coconut milk soup, flavoured with fresh galangal, lemon grass, kaffir lime leaves and mushrooms. Special Thai Soup, fresh lemon grass, kaffir lime leaves, mushrooms & imported herbs, made with pieces of King Prawn. Baby prawns in a traditional cocktail sauce. Tender pieces of chicken, lamb or king prawn, cooked with green chillies, green peppers and onions in a richly spiced hot sauce. Cubes of lamb cooked with mint, coriander, other selected spices and garnished with green chillies and spring onion. Medium hot. Chicken cubes marinated in spices, roasted in tandoor oven then cooked with minced lamb. Medium hot. Tender pieces of chicken cooked with special spices, red chilli and coconut. A traditional Sri Lankan hot curry. Tender pieces of chicken cooked with a blend of herbs cashew nuts rose water and cream giving a mild taste and smooth texture. Lamb, chicken, seekh kebab tandoori chicken and king prawn, roasted in a clay oven and served with fresh salad, nan bread and a mild sauce. Cubes of chicken, green peppers, onions and tomatoes marinated overnight in a house special spicy yoghurt sauce skewered and grilled in tandoor oven. Tender pieces of chicken marinated in almond, yogurt, Chef’s selection of spices and cooked in Tandoor Oven. Combination of cauliflower, peppers, minced vegetables, cottage cheese and tomatoes marinated in Chefs special blend of herbs and cooked in Tandoor. King prawns cooked in Bangladeshi style with mustard paste, green chillies and yoghurt.Medium hot. Tender pieces of lamb cooked in a medium hot sauce with rinds of a special Bangladeshi citric fruit, kaffir lime leaves and Bengal chillies. Seasonal fresh water fish from Bangladesh, marinated in special spices and herbs then cooked in a medium hot sauce. Tender pieces of roasted chicken, cooked with spinach in a rich medium hot sauce. Tender pieces of chicken cooked with mango pulp, cream and selected spices in a mild sauce. Diced king prawn wrapped in thin filleted chicken and cooked in a rich and mild sauce. Chicken in a medium to hot panaeng curry, flavoured with lime leaves, red pepper, coconut milk and red chilli paste. Steamed king prawn cooked with black bean sauce, ginger and onions.Medium hot. Special spices, capsicums, carrots, sesame oil and soy sauce and garnished with sesame seeds and coriander leaves. Popular medium hot green curry dish. Chicken cooked with green beans, coconut milk, galangal, lemon grass, kaffir lime leaves and basil. Thinly sliced pieces of beef, stir fried with a selection of traditional Thai spices and basil. Hot. Spicy trout served with fried mushrooms, tomatoes, green chillies and fresh herbs, accompanied with a mild sauce. Tender pieces of chicken marinated in spices, roasted in a charcoal oven and cooked in lentils, spring onion, fresh garlic and ginger, topped with fresh herbs and lemon.Medium hot. Minced meat, mixed with spices, enclosed in special pastry and steamed in the traditional way of the mountains of Nepal. Chicken cubes roasted in tandoor, pan finished with fresh garlic and special hot sauce, topped with fresh green chillies. Tender pieces of chicken or king prawn marinated in a blend of spices and herbs roasted in charcoal oven then cooked in a mild sauce. Popular dish from Jaipur prepared from tender pieces of chicken tikka or lamb cooked with ground onions, green peppers, mushrooms, fresh herbs and spices. 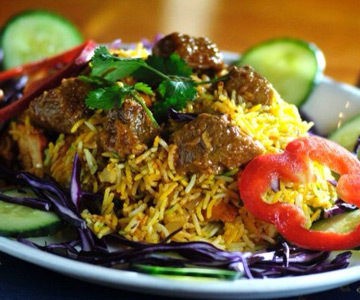 A popular dish of lamb cooked with ground pistachio, cashew nut and almonds in a mild sauce. Tender chicken marinated with special spices, roasted in tandoor oven, cooked in a ginger based medium hot sauce and garnished with fresh coriander. Tender pieces of lamb cooked with potato, a touch of garlic, fine herbs and spices. Medium hot. A biriyani is a special preparation of saffron rice prepared together with chicken, lamb, king prawns or vegetables with a blend of delicate spices, herbs, touch of ghee and served with vegetable curry. Fresh vegetables mixed with coriander, almonds, cardamom and cooked in a creamy mild sauce. Fresh mixed vegetables cooked with touch of spinach in alentil-based hot sauce and finished with lemon juice to taste. A traditional South Indian recipe. Fresh mixed vegetables, cooked with fine herbs and spices. Medium hot. A delightful blend of fresh spinach, carrots and cashew nuts cooked with fine herbs and spices. Medium hot. Cottage cheese cooked with fresh fenugreek leaves and chef’s selection of spices to a medium hot taste. Should you wish, we can offer any of the Vegetable Side Dishes in a larger portion as a Main Dish, or if you have any special requirements, please consult our ‘crew’. Prime Scottish sirloin steak, tenderised, cooked to your preference and served with fresh salad, vegetables and French fries. Roast chicken served with French fries and vegetables. Lentils prepared with fresh garlic, onions, special spices and herbs. A unique blend of potatoes and cumin seed with fine herbs and selected spices. Pan fried cubes of aubergine tossed with onions, tomatoes and spices. Fresh cauliflower and potatoes cooked with green herbs and selected spices. Fresh mixed vegetables, cooked with a unique blend of fine herbs and spices. Fresh okra fried and then cooked in a unique blend of herbs and spices. Fresh mushrooms, cooked in a blend of herbs and spices. Boiled chick peas, cooked with green herbs and spices in a rich medium hot sauce. Fresh spinach cooked with potatoes and selected spices. Freshly spiced Spinach, cooked with cheese made to an Asian recipe. Medium hot. Should you have any food related allergies, please consult with our management who will be obliged to assist in your choice. All products used in the preparation of our dishes are to the best of our knowledge free of GM ingredients. PLEASE NOTE ALL ORDERS MUST CONTAIN MINIMUM ONE MAIN COURSE PER PERSON. VAT IS INCLUDED IN OUR MENU PRICES. Service charge is NOT included in our menu prices. TAKE AWAY orders are subject to a discount of 15% from the menu prices. Group discounts are available for parties: subject to prior agreement and exclusive of Friday and Saturday evenings, and public holidays. Please see other sections of our web site for special promotions, events and celebration evenings. Our professional outside catering service is always available. We have carefully selected a range of desserts to provide that perfect finale to your dining experience and to extend your enjoyment of our exotic cuisine. We have brought together a collection of classic desserts which perfectly compliment the sumptuous spicy food you have already sampled. These traditional favourites and international classics have been selected to offer you a refreshing counterpoint to your meal. Coffee or tea is always a popular way to round off a feats and we will freshly brew a cup to your specification. But why not let us make it a little more indulgent by presenting you with a selection of fine liqueurs and spirits from around the world? Alternatively let us create a sumptuous liqueur coffee for the ultimate culinary finale. Natural fruit sorbet contained in its own fruit skin. Light and refreshing. Lemon ice cream rolled in crushed meringue with a limoncello sauce. Coconut ice cream rolled in chocolate pieces & shredded coconut with a meringue centre. Dairy vanilla & chocolate hazelnut ice cream, meringue centre, covered in hazelnut pieces. Dairy vanilla &toffee ice cream rolled in delicate fudge pieces. Authentic Indian style ice cream. A choice of mango or pistachio. Banana dairy ice cream with a toffee centre, covered in white chocolate & amaretto biscuit. Vanilla & toffee ice cream with toffee coated pieces &caramel sauce. Novelty toy filled with smooth vanilla ice cream. Originally produced for the personal use of Mr Maurice Hennessy. X.O is a blend of more than one hundred very old ‘Eaux-de-vie’ from Cognac’s finest growing regions. The gentle evocative spirit of Italy. The ‘kiss’ of the Irish. A historic touch of France. Handed down by the ‘Prince over the water’. That coffee with a zing. Try it with ice on a hot day. Whisky and secret ingredients – Highland ecstasy. Fire and orange a memorable touch of France. All priced by the glass. Diced cubes of chicken and lamb roasted in tandoor oven, served with vegetable pakora, salad and sauce. Cubes of lamb cooked with mint, coriander, other selected spiced and garnished with green chillies and spring onions. Medium hot. Tender pieces of chicken marinated in a blend of spices and herbs roasted in charcoal oven then cooked in a mild sauce. Fresh mixed vegetables cooked with a unique blend of fine herbs and selected spices. Pilau Rice and Peshwari Nan. Any of our other promotional offers of discounts are not valid with above price. Vegetable samosa and vegetable pakora. Fresh mixed vegetables cooked with touch of spinach in a lentil based hot sauce and finished with lemon juice to taste. A traditional South Indian dish. Mushrooms fired with fresh garlic, onions and selected spices.